Today I have walked 12265 steps, or that is at least what my pedometer tells me. That means 7,3 kilometer (3, 5 miles) and 288 calories burnt. That equals (probably) one tuna sandwich and two pints of beer and a chat with Laila, one of my best chums. The latter being completely calorie-free of course. Lucky me!! Fyret, or the Lighthouse, is one of my favourite hangouts in the Norwegian capital. 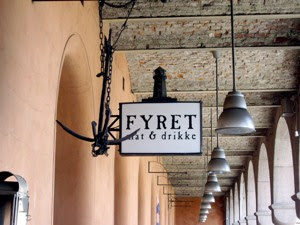 Located in the bazaar under the old Police station in Møllergata. A tiny cafe/restaurant serving French/Danish/Continental food. Here you get the best Danish open sandwich in town - with warm liverpaté served on rye, raw onion and pickled cucumber. What to choose on this cool evening of June, when you experience a fall in temperature from 31C (96F) to less than 20C (68F)? The sandwich of course, - mine having a large heap of tuna salad made from mayo, tuna, raw onions, curry powder as main ingredients, garnished with black pitted olives. Recipe claimed to be inspired by a tuna experience on 42nd street in the Big Apple. And two dripping cold glasses of beer. One should at least pretend that the heat was here still, and I had burned the calories, after all! !